Before now tarpaulin have been used to cover equipment and machinery against weather damage onsite, during transit and for farm storage outdoors. Tarp materials are available in various grades from lightweight woven polythene to heavy canvas cover but the fitting method basically has to do with pulling tarpaulin over equipment and tying down with rope threaded material through a series of metal eyelets which are sewn around the cover. Tarpaulins are useful and efficient for covering small objects or equipment but will surely have challenges when it has to cover larger equipment or machines especially when they are in transit. Is It Worth Using Tarpaulins? Tarpaulins are not efficient when they are used in covering large equipment or an irregular shape machine, it will be difficult to tightly fit a tarpaulin over such equipment. If tarpaulin is used to cover an object on transit, it is faced with challenges to withstand wind speeds, or after some time, the cover starts flapping, and may eventually self-destruct, with possible damage, the equipment. When the machine to be covered is large, there is no single tarpaulin to cover a heavy duty equipment in one covering. The tarpaulin is split to enable it to cover the equipment but it will not be tightly fit which may cause damage to the covered equipment. Tarpaulins used in covering equipment or machine to be transported to another country are removed at the destination of the machine and returned to base. The returning of tarpaulin are inconvenient and expensive. No matter how good or tough a tarpaulin is, it will require cleaning when it starts looking scruffy especially tarpaulins used in covering equipment indoor or not in use machine. Do You Know The Benefits Of ALCO covers? Tough – the resilience of ALCO covers makes it tough to flap or self-destruct covered material in high winds. Versatile – covers can be made for every equipment, there is no restriction on size, pattern or shape of an equipment. ALCO covers offer a tight and tear resistant covering over any size or pattern of equipment. 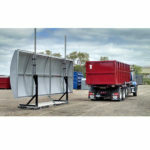 ALCO covers are the best in the industry for heavy-duty equipment or machine transit cover, they surpass the disadvantage of using traditional covers that is likely to detach or flap on transit and cause damage to equipment during transport. The heat welding in the covers provides a continuous bonded skin without holes or gaps, unlike the traditional covers. Apart from securing equipment from weather and environmental damage, using an ALCO cover can keep it hidden. During inspections, equipment covers with zipped access are unzipped for easy inspections. ALCO covers offer a smart and professional look to equipment. With its unique style of production, covers come in various colors in different fabrics. The logo or Brand of companies can also be placed or inscribed on the covers to make it look more portable and exclusive. Our covers are easily installed and can be removed in the same way, they can be eliminated or recycled depending on what the client needs as our covers are made to the satisfaction of the need of our clients.